Over 200 people braved the thunder and rain on King Plaza in Palo Alto for a Peace Picnic followed by Multifaith Prayers for Peace & Justice. (For the words of the poem read at the picnic, click here.) The program included all ages, many faith traditions and people from diverse ethnicities and backgrounds. Gathering songs were led by Chris Lundin of St. Thomas Aquinas Catholic parish, and the Mitzvah Singers from Congregation Etz Chaim, both in Palo Alto. 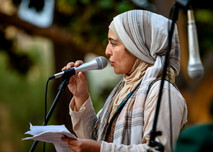 Other musical offerings came from Baha'i singers Mahrou Derakshani and Chris French, young adults from the Sathya Sai International Organization, Region 7, and a children's choir from Congregation Beth Am. The Sound of the Shofar, an Islamic Call to Prayer, a Christian Call to Worship and a Buddhist invitation to silence called us together, and Rabbi Amy Eilberg welcomed us into community and prayer. 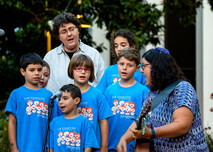 Speakers included Cantor Jaime Shpall from Congregation Beth Am (pictured with the children's choir above), Farha Andrabi Navaid (pictured right) who is President of the MVPA Musalla, a worship and community center for Muslims in the Palo Alto area, Rev. Fa Jun, a Buddhist/Interfaith minister from the Unitarian Universalist Fellowship of Los Gatos (pictured left), and Rev. Annanda Barclay from the First Presbyterian Church of Palo Alto (pictured below in the closing circle). A Prayer of Lament was led by Farukh Basrai, from Anjuman-e-Jamali and MVPJ, and Rev. Mark Arevalo from Spark Church, Palo Alto. MVPJ holds Peaceful Presence Prayer gatherings on the 11th of every month. On October 11 the Baha'i Community of Palo Alto will host the service. Click here for more information. We thank Chris Cassell and Alfred Leung, afflicates of Pro-Bono Photography for the wonderful photos! To see more great pictures taken by them, click here and here. If you share these photos, please be sure to give them credit! 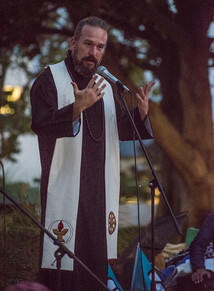 Twenty-seven local faith communities co-hosted this Sept. 11 event. Co-hosts include All Saints Episcopal Church, Palo Alto; American Muslim Voice; Anjuman-e-Jamali (San Jose Muslim Organization); Baha'i Community of Palo Alto; Bend the Arc: A Jewish Partnership for Justice; Buddhist Peace Fellowship, West Bay Chapter; Congregation Beth Am; Congregation Etz Chayim; Council on American-Islamic Relations (CAIR-SFBA); First Baptist Church of Palo Alto; First Congregational Church of Palo Alto; First Lutheran Church of Palo Alto; First Presbyterian Church of Palo Alto; First United Methodist Church of Palo Alto; Heartbeat: A Journey toward Earth's Wellness; Human Concerns Committee, St. Thomas Aquinas Parish (Catholic); Keddem Congregation; Oshman Family Jewish Community Center, Palo Alto; Peninsula Solidarity Network; Region 7, Sathya Sai Int'l Organization USA; Silicon Valley Interreligious Council (SiVIC); Spark Church, Palo Alto; St. Mark's Episcopal Church, Palo Alto; Trinity Church in Menlo Park (Episcopal); Unitarian Universalist Church of Palo Alto; Unitarian Universalist Fellowship of Los Gatos; University AME Zion Church of Palo Alto.